It is beautiful and gives our bedroom that romantic bohemian look. I mix and match purple, sea glass, and sage green sheets to go with it. Love the look and feel! 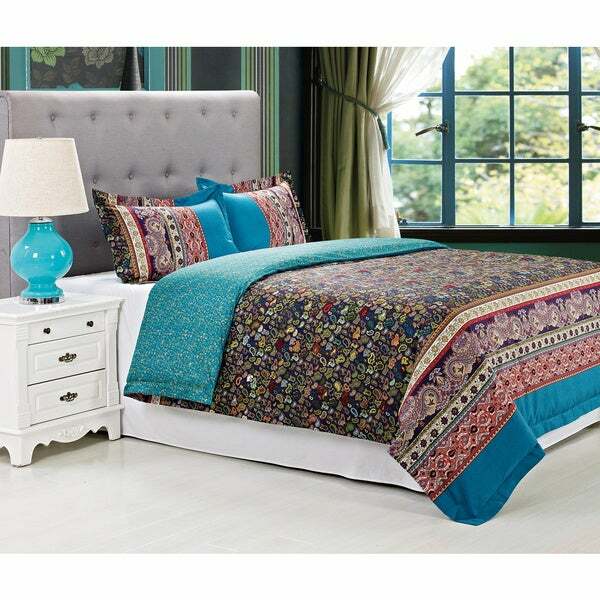 Brighten your bedroom with this colorful, paisley-patterned Rosewood duvet cover set. The set includes one duvet cover and two pillow shams made from 100-percent cotton that offers practical comfort for a night's sleep. The set features a printed fabric detail and small paisley patterns that accentuate any bedroom decor. The set, which is reversible and machine washable, is not only easy to clean up but also durable. I bought this for a boho chic look for my bedroom & will mix with other colors to enhance the pattern. The colors are so vibrant and better than anticipated. I recommend washing it before use as it is a bit scratchy. One detail that is not spot on is the green ribbon on the edge of the duvet. I do not mind as the turquoise is better off alone. I shopped for a duvet set for about a couple of months and as soon as I ran into this one I knew it was the one. I did not know what to expect for the shams as it doesn't specify and the exact ones that i received are not pictured but are very nice. Absolutely no regrets purchasing this set. No fuss, No muss. Simple elegance. The colors are a bit darker than pictured. The teal on the back side is closer to a blue, but it is still gorgeous! I wanted a patterned and elegant duvet cover that was soft AND durable. Since the front and back of the cover are two whole pieces sewn together, I have not run into the problem of frayed edges and loose seams. It is more common for duvet covers to be "quilted" together with sections and mixed fabrics to create detail, but they often come loose and fray at the seams. So far I have put this cover on both a bedspread blanket and a down comforter to protect the bedding from my silly border collie who likes to sometimes sneak onto the bed while we're away. It has held up. The shams are nice and soft too. I have washed the cover 3 times so far in a cold-water washing machine with woolite, and then dried it in an electric dryer on low heat with some anti-cling fabric sheets. The material has not thinned or pilled, and the color has not faded or bled. I would describe the soft-ish material as "light-weight durability." The fabric is not thin, but it's not the thickest weave out there either. It is a great summer-weight cover for micro-duvets and bead spreads! This duvet cover is well sewn, a colorful and smooth fabric for my down comforter. The complex paisley is well printed on the front side, with crisp edges on the designs, and a more watercolor style on the reverse. Multi-colors pop and brighten up the bedroom. Seems like it would go with most anything. Laundered beautifully, not too hard to put onto the duvet. Only had to touch up the pillow shams with an iron. Celine the Cat loves having the fluffy duvet on the bed for the winter. I love how easy it is to wash and dry. Other reviews mentioned this, main reason for my purchase. I purchased this set for my daughter's bedroom who had a retro hippy theme developing.One criteria,there had to be some teal blue.This set has it all, the colors give you so many decorating choices.The quality is great, it is easy to machine wash and tumble dry on low heat,the few wrinkles it may have drop out quickly when it is put back on the duvet.It is soft and comfortable.The fabric is a nice medium weight. The image shows vibrant jewel tone coloring, and the actual product colors aren't nearly as strong. The blues are more navy than the royal blue pictured. Yellows are mustard-ish. The feel and construction are fine, but I was disappointed the coloring appeared very different from the photo. The picture does not do it justice. This duvet cover is so colorful and soft. Fit my down comforter just right. I did get the Cali king because I needed it to be long on the sides. I have a California king bed and the Duvet wasn't as large as expected. It covers the bed, but doesn't cover it as much as I would have preferred. However, I love all the colors and it looks vibrant. Colors were as illustrated and quality was excellent. I have washed it twice now, once before using and once due to "someone's" carelessness with coffee. Both times, the cover washed well and came out of the dryer with no wrinkles. I love how it brightened my bedroom! Bought one set for my daughter. It is so beautiful I bought one for myself. Vibrant colors, material satiny smooth cotton, reversible, exotic/hippy pattern. Washes very well. Favorite duvet set ever. I am very satisfied with this product. The colors are great and it fits the bed just right. My only complaint is that after the initial washing it is still scratchy. I figure this will eventually soften and the scratchiness will go away. I totally agree with the last review dated 8/7/14. The photo used in the online catalog and the product I received are not the same product. I also noticed that Overstock changed the photo of the product today! The new photo accurately represents the product I received but does not accurately represent the product I ordered. If I had seen the photo that is now being used to represent this product I would never have ordered it! I will never order from this site again. My daughter and I scoured the web looking for just the right bedspread for her to take to college (she's a freshman). We were getting really frustrated until we found this one. It's lovely in the picture and even prettier in person.The only issue we had was finding a duvet to use inside! We bought the Full/Queen for her Twin XL bed and it's perfect. As Beautiful as in the picture on-line. Lovely to touch. I can't wait to use it with my down comforter this winter. This duvet cover exceeded my expectations,exotic and colorful. This is hands down my favorite duvet. So much so I have purchased 2x as the first one started to fade a bit from extensive use. Very soft, the colors seem pretty true to the pictures. Might just buy again! I don't use this as a duvet but as an actual cover. It's thin enough to keep warm Florida nights comfortable. It's pretty and understated. It doesn't cover my whole king bed though, at least it doesn't to my liking. The colors on this comforter are just beautiful. rich dark colors. The fabric has a silky sheen to it. The solid color side is more of a green than blue. But I don’t mind that. Colors are vibrant and the fabric is soft. I bought a few bright colors for sheets and they all look beautiful together. Buttons at the bottom fell off after a few washes- not a huge deal to sew back on. Beautiful colors, fragile fabric . Love the variety of colors to use to enhance the appearance and decor is unlimited ! Wash very carefully in cool water. I really love this set!!! The duvet has a thick, luxurious feel. The colors are really vibrant. Overall exactly what I wanted and expected. A great purchase!! Love the vibrant colors and fits comforter really well. Only thing is that the buttons keep coming undone. "Is the solid blue a turqouise blue or a green? And the buttons are only on the shams right?" This set features a beautiful, vibrant turquoise tone. "I noticed that some of the older comments from 2014 said that the duvet cover was scratchy and the more recent comments from 2016 said it was soft. Has the fabric been changed from the older covers?" This duvet set still comes with the same composition and constitution as in years previous. The reviews are just based on the customers opinions of the item. "Could you tell me the background color of this duvet. Online it looks like a deep purple, or is it navy? Thanks"
Hello ilovequiltslots, we try to represent the colors of our products accurately. Unfortunately, due to the difference in monitor colors we cannot guarantee that the color will match exactly what you see on your screen. In my opinion, the background color is a dark blue where the main paisley pattern is and appears to be a dark purple underneath. Thank you for shopping with us. I bought this duvet cover last season and I love it. The dark ground color is a very dark navy blue. The top and bottom ends have wide bands of turquoise/teal. The fabric has a low sheen and feels very soft. I recommend a little white vinegar in the wash and drying it inside out to help keep the colors vibrant. It looks great and I'm very happy with it. "Is the 300 ct cotton sateen?" 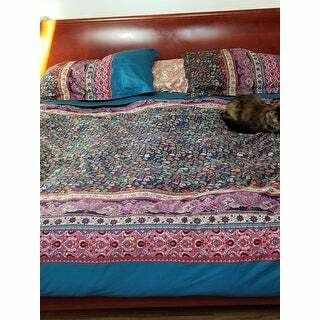 Hello karenval, this is a 300 thread count cotton similar to sateen. Thanks for shopping with us! "Does this sheet fit well on a California King bed?" Hello Shawni2015, this item features one (1) duvet cover and two (2) pillow shams, sheets are not included. Thank you for shopping with us. "hi, i have been interested in this product for a few days, but the updated picture you have looks alot different then the first one. i was wondering if it is the same duvet cover?" @neikko456, i understand why youd be worried! if you could let me know how it turns out, i would really appreciate it! Hello kyra14, the updated picture is a more accurate depiction of the colors. I hope this helps you! Thank you for shopping with us. The first picture I saw, it looked more like a satiny fabric with several sewn together. It's not. The different patterns and colors are woven into the fabric. Even though it looks different than I had thought, I still love it. This picture is much more accurate.